The life and career of George Frideric Handel, one of the most frequently performed composers from the Baroque period, are copiously and intricately documented through a huge variety of contemporary sources. This multi-volume major publication is the most up-to-date and comprehensive collection of these documents. 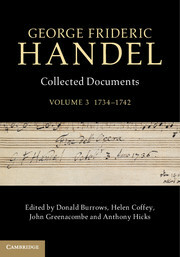 Presented chronologically in their original languages with English translations and with commentaries incorporating the results of recent research, the documents provide an essential and accessible resource for anyone interested in Handel and his music. 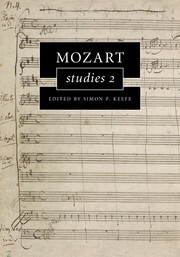 This volume begins with Handel's move to the Covent Garden theatre, during the period of his competition with the Opera of the Nobility, and ends with his season of oratorio performances in Dublin. These years saw the composition of Italian operas including Ariodante, Alcina and Serse but also of the major English works Alexander's Feast, Saul and Messiah. Donald Burrows is Professor of Music at the Open University, a Vice-President of the Händelgesellschaft, Chairman of the Handel Institute, General Editor of the Novello Handel Edition and a member of the Editorial Board of the Hallische Händel-Ausgabe. 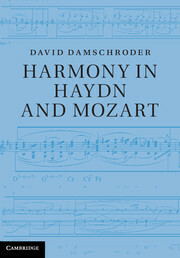 His six books about Handel and his music include The Cambridge Companion to Handel (1997), and he has edited many editions of Handel's works, including Messiah and Samson and the operas Ariodante and Imeneo. 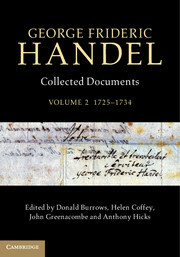 His book A Catalogue of Handel's Musical Autographs (1994, with Martha J. Ronish) was awarded the Vincent H. Duckles Award by the Music Library Association. Helen Coffey is Lecturer in Music at the Open University and has worked on the Handel Documents Project since it began in 2007. Her doctoral dissertation (University of Oxford, 2006) focused on the patronage of instrumentalists in Germany during the late fifteenth and early sixteenth centuries. 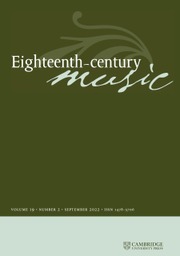 This subject, and the activities of court and civic musicians in England at the same period, have formed the focus for subsequent published articles; her current research interests include the musical patronage of King George I as Elector of Hanover and the careers of German musicians in England during the eighteenth century. John Greenacombe is a Visiting Research Associate at the Open University and a Trustee of the Handel Institute. An architectural and urban historian, he was formerly General Editor of The Survey of London. His participation in the Handel Documents Project has enabled him to bring together his experience of British archives and a long-standing interest in Handel's life and music. Anthony Hicks combined a career as a computer systems analyst with an influential role as a researcher, critic and author on musical topics, particularly relating to Handel. 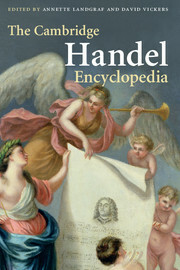 His publications include an article on Handel in the second edition of The New Grove Dictionary of Music and Musicians and the entries for all the Handel operas in The New Grove Dictionary of Opera. A founder-member of the Handel Institute, he also played a leading role as advisor to the Handel Opera Society in London, the Maryland Handel Festival (USA) and the London Handel Festival. His appointment to the Handel Documents Project in 2007 enabled him to fulfil a long-held ambition and he continued to contribute to the project until his death in 2010.